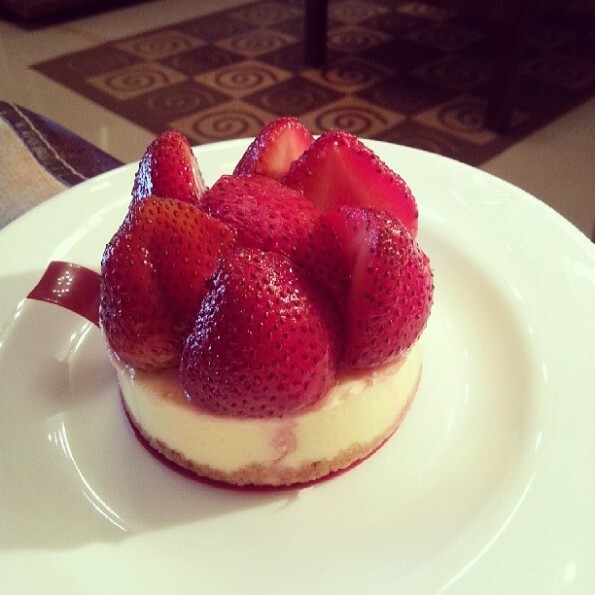 Eggless strawberry flavored cheesecake with easily available cheese spread which needs no baking. This recipe yields yummy and delicious cheesecake with real creamy texture. Line an eight-inch spring form cake pan with plastic sheet covering its bottom and walls. Combine crumbled biscuits and butter in a bowl and mix well with your fingertips rubbing them to incorporate both nicely. Spread and press this buttery mixture onto the bottom of prepared spring form pan, smooth the surface with the back of a spoon. Refrigerate until filling is prepared. Put a small saucepan on medium heat with chopped strawberries and sugar in it. Tip: You may use frozen or fresh strawberries; just thaw them before using. Cook while stirring for 10 minutes or until juices release from strawberries, sugar is well dissolved and the mixture thickens like syrup. Then remove this strawberry compote from heat and keep aside to cool. Sprinkle gelatin over 2 tablespoons of water and let stand for 10 minutes. Beat cheese spread and caster sugar in a bowl with electric mixer until both are well blended and smooth. Stir in gelatin solution and mix well. Now stir in ½ of strawberry compote and mix well. Then gradually fold in whipped heavy cream gently. Spread a layer of remaining strawberry compote over prepared crust in spring form pan and pour the cheesy mixture over strawberry compote layer to cover it completely. Tap the pan gently on slab to smooth the surface and refrigerate for at least 2 hours. Bring out from refrigerator and un-mould cheesecake gently, unwrap the plastic sheet from sides and transfer the cheesecake onto serving platter very carefully with the help of a wide flat spatula. Garnish with reserved strawberries and serve.